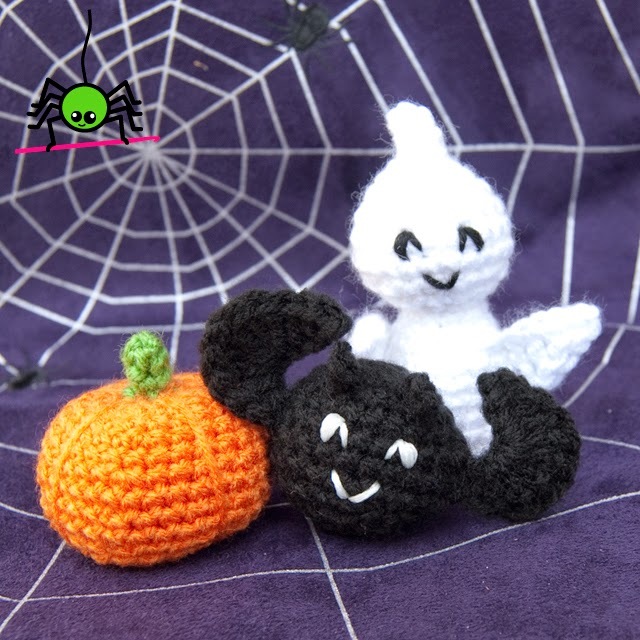 The Itsy Bitsy Spider Crochet: No-Sew Halloween Patterns! You only need to look at my pattern collection to realize that Halloween is my favorite holiday. There's just something about having a blank check to eat as much candy as you want AND play tricks on those who don't comply -- it speaks to me. Unfortunately, having a child with significant food allergies puts a pretty big damper on the holiday. We still love dressing up and going out to trick-or-treat, but when she gets home, with her loot, we end up having to "trade" 90 percent of her haul for soy and dairy-free alternatives. The classroom is no better. The class Halloween party ALWAYS focuses on food, and there are so many treats that my Little Miss has to miss out on. Since she started kindergarten last year, I've been trying to make that different for her: we give tiny amigurumi instead of cupcakes. Of course, with a class of 20+ kids, who has time to sew all the little arms and wings? To answer that question, I've come up with some new, no-sew patterns. In fact, the only sewing on ANY of these three patterns is the optional embroidered faces (you could also paint or glue faces if you prefer). You can find all three patterns through my usual sales outlets (Ravelry, Etsy and Craftsy) -- or download them right here on my website. The ghost and bat are $1 each and the pumpkin is free.